Battlefield V’s battle royale launches next week, Mortal Kombat 11 closed beta starts on March 28th for the PS4 and Xbox One, Life is Strange 2’s remaining episodes have launch dates, and HITMAN 2 will receive a new Sniper Assassin map next Tuesday. Didn’t Smokey the Bear warn you about forest fires?! Battlefield V’s battle royale mode Firestorm is launching on March 25th. It feels cliche to say that EA is putting the “Battlefield touch” on their version of battle royale but that sort of seems to be the case. On the biggest map in the game’s history, players will of course navigate the environment for loot and vehicles while trying to survive against other teams. Completing resupply drop objectives can bring in some extra goodies for your squad which might include a tank. And who wouldn’t want to drive a tank? The best and rarest land vehicles are locked up and it will be up to your squad to work together to unlock the bases where they are housed. Of course, tanks and jeeps are not the only vehicles as boats can be used to travel the water areas and a prototype helicopter can take you by air. All this takes place while a burning ring of fire scorches anything in its path so if you’re thinking of hanging near the edge, it may not be wise to do so. Overall, Firestorm looks fine but will it be enough to bring back players to Battlefield V? If you were curious about the release window of the next episodes for Life is Strange 2, there is some good and bad news. The good news is that the final three episodes all have dates attached to them. The bad part is that the wait between episodes is going to be a little substantial. Episode 3 will launch on May 9th but Episode 4 will not premiere until August 22nd. Then the wait for the final Episode is a long one as it will not launch until December 3rd. A closed beta for Mortal Kombat 11 will take place from March 28th through the 31st. Participating players can mess around with Skarlet, Baraka, Jade, Kabal, and Scorpion in online matches or take to single-player with Towers of Time. 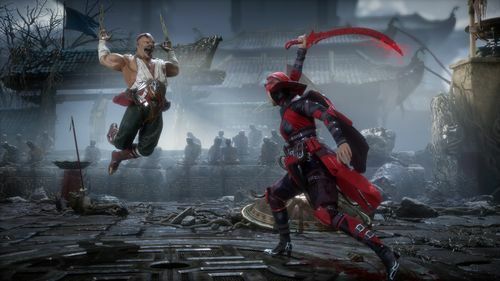 Players can also get a taste of MK 11’s character customization and give fighters their own flavor. This closed beta is for the PlayStation 4 and Xbox One and only for those who have pre-ordered Mortal Kombat 11. The next Sniper Assassin map for HITMAN 2 is launching next week on March 26th. Hantu Port tasks Agent 47 with saving two hostages and taking out three targets. Taking place at a port, there should be plenty of different and creative ways of taking out enemies. Hantu Port is included with HITMAN 2’s Expansion Pass.